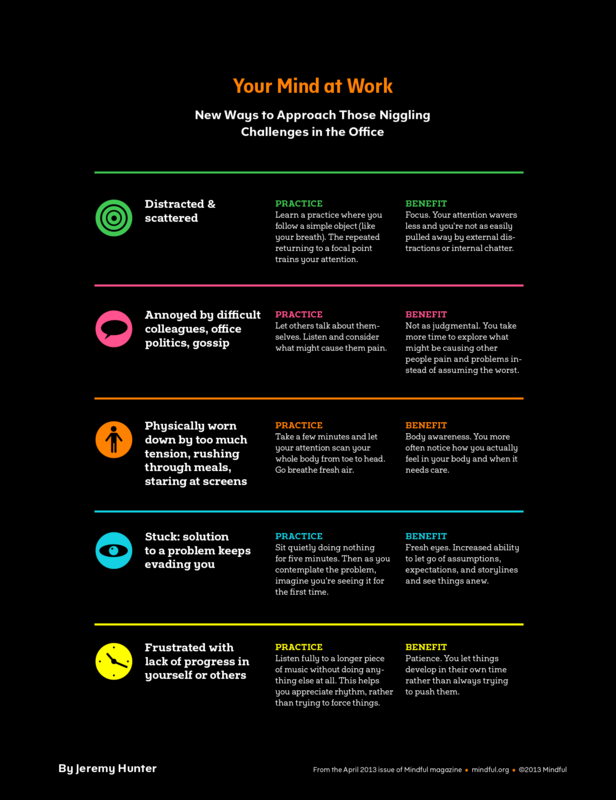 For each of these thorny workplace problems, try the recommended practice, enjoy the benefit—and keep this chart handy. PRACTICE: Learn a practice where you follow a simple object (like your breath). The repeated returning to a focal point trains your attention. BENEFIT: Focus. Your attention wavers less and you’re not as easily pulled away by external distractions or internal chatter. PRACTICE: Let others talk about themselves. Listen and consider what might cause them pain. BENEFIT: Not as judgemental. You take more time to explore what might be causing other people pain and problems instead of assuming the worst. PRACTICE: Take a few minutes and let your attention scan your whole body from toe to head. Go breathe fresh air. BENEFIT: Body awareness. You more often notice how you actually feel in your body and when it needs care. PRACTICE: Sit quietly doing nothing for five minutes. Then as you contemplate the problem, imagine you’re seeing it for the first time. BENEFIT: Fresh eyes. Increased ability to let go of assumptions, expectations, and storylines and see things anew. PRACTICE: Listen fully to a longer piece of music without doing anything else at all. This helps you appreciate rhythm, rather than trying to force things. BENEFIT: Patience. You let things develop in their own time rather than always trying to push them.